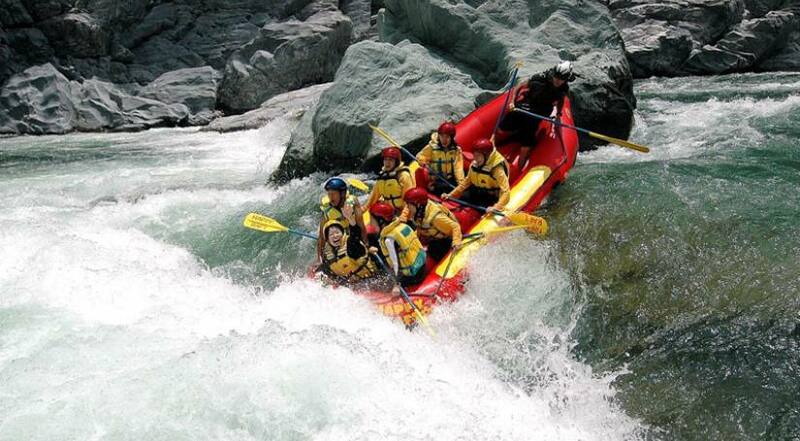 The Bhote koshi River rafting is also one of the best sports in Nepal. Bhotekoshi River is the most popular and easily accessible river from Kathmandu. The rafting trips in Bhotekoshi can be designed for various timeframes, as it is reached easily from Kathmandu. Bhotekosi is known to the River from Tibet. The Kathmandu-Lhasa highway runs along the river. The Bhotekoshi is regarded as one of the best short white water rafting trips in the world. It is the steepest river that is rafted in Nepal, with continuous rapid action making this river a full-on commitment and a huge adrenaline rush. This is an ideal trip for those wanting a short, but intense and thrilling rafting trip. Bhotekoshi River rafting suit to those who have rafting experience in an advance, as it is the most challenging rafting due to its strong currant. You can have one or two day trips this river. It is the beautiful sport for adventure trip with very steep and basically non-stop mountain river only 3 hours drives from Kathmandu. If you have never rafted before and if you have limited time but desire to have an experience in an adrenaline overload, then this is a perfect introductory trip package for you because of the BhoteKoshi is probably the most exciting short rafting trip in Nepal and the best white water adventure in the world. While rafting in Bhotekoshi River, you also get the chance to observe emerald green fields terraced high above the river on precipitous slopes, curious villagers lining suspension bridges are amazed, as we plunge through cascading waves and chutes of foam. The rapids here are a solid class 4 to 5 at high flow, and a more classic 3 at lower levels. You will drive about 4 hours to Lamosangu, 95 km away from Kathmandu then starts the rafting on Bhote Koshi(River) about 10 km. It will be most exciting white river rafting experience and you will spend the night in the tent. After breakfast, your rafting adventure starts with the rapid but full of fun. your rafting will end before lunch time at Dolalghat, after having lunch you will drive back to Kathmandu.